Since all the schools in Delaware County declared Wednesday a snow day and closed, students didn’t let the day go to waste. The sledding hill at Gallant Woods Park brought smiles, laughter, and some snow to the faces of the children like Chaz Sakala. He caught a face full of snow as he got to the bottom of the hill. 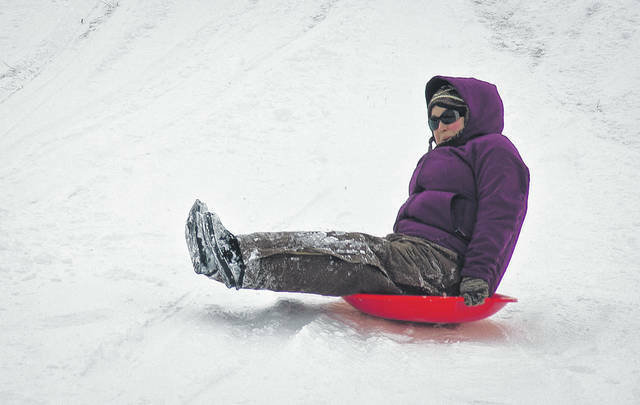 While some parents stayed in their cars to keep warm Wednesday, others decided to get in on the sledding fun at the Gallant Woods Park sledding hill with their kids. Parent Devon Priddle would sled down, turn around, and run back to the top of the hill right alongside the kids. Priddle said she and her family would sit in the car to warm up a bit, but after awhile, it was back to the hill to sled some more. 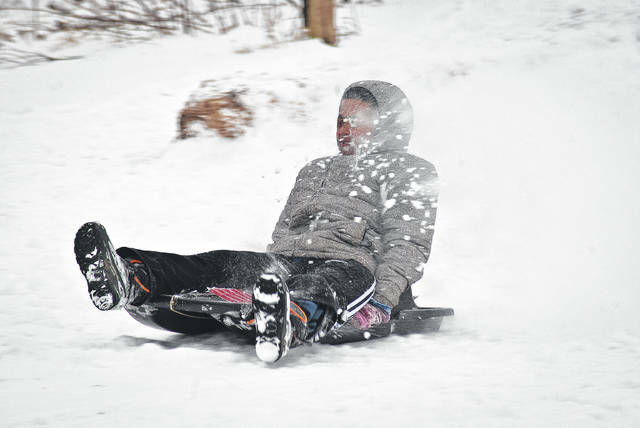 Depending on one’s point of view, Wednesday was either a snow day full of carefree sledding or a nerve-racking driving experience on snow-covered roads. The National Weather Service in Wilmington, Ohio, reported Delaware County received three inches of snow by 8:15 a.m. The Delaware County Sheriff’s Office declared a level two snow emergency for Delaware County at 7:05 a.m. and asked motorists to use caution when driving on county roads. The sheriff’s office also discouraged any unnecessary travel. The level two emergency was downgraded to a level one at 11 a.m., and by 3 p.m., the sheriff’s office had canceled the alert. The snow accumulation caused Big Walnut Local Schools, Buckeye Valley Local Schools, Delaware City Schools and Olentangy Local Schools all to close for the day on Wednesday. Buckeye Valley posted an alert on the district website and Facebook page stating that the parent-teacher conferences at the high school scheduled for Wednesday evening were rescheduled to Thursday, Feb. 15. If parents were unable to keep their scheduled times, they were to email teachers to make other arrangements. Big Walnut Local schools posted to both their website and Facebook pages that all schools were closed in the district Wednesday, Feb. 7. Delaware City Schools posted that the schools would be closed on Wednesday, Feb. 7, on both Facebook and the district website with a reminder to parents and students about the scheduled two-hour delay Thursday, Feb. 8, for the teacher in-service. Olentangy Local Schools posted Wednesday, Feb. 7, that all after-school activities were canceled. Delaware County District Library locations in Delaware, Ostrander, Orange Township and Powell all were closed for the day, and the Community and Family Outreach Services didn’t make home deliveries or institutional bookmobile stops. SourcePoint closed for the day, canceling meal deliveries, all dining centers, enrichment center programs and volunteer services. The Delaware County Board of Commissioners’ offices closed for the day with only the essential staff told to report Wednesday. Prosecutor Carol O’Brien said her office was closed for the day with some staff coming in to catch up on work. This entry was tagged D. Anthony Botkin, delaware county, Gallant Park, snow. Bookmark the permalink.